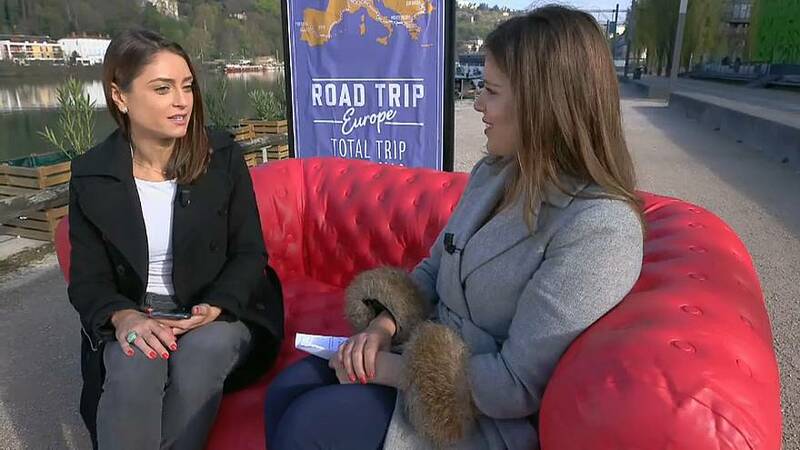 Euronews correspondent Anelise Borges has brought Road Trip Europe to headquarters in Lyon, after travelling for over two weeks through Portugal, Spain, and southern France, she's pulled up at Euronews' front door to pass on the road trip baton to correspondent Jack Parrock, and reflect on what she's seen so far. "We wanted to hear from people on the issues they care about, so unemployment, the economy, politics, healthcare, education. Whatever was on their minds," she told Cube host Rosie Wright. At a fish market in Setubal, Portugal, the vendors were eager to share a general sense of disillusionment. "Politicians are destroying us. They only create problems for the people. They don’t help us. Politicians only help big companies where they hold interests. I’m saying this because I’m not a politician and I don’t want anything to do with these people. So tomorrow they can go work with these companies, make a lot of money, because they’ve already got fat contracts to guarantee their future- not ours." "In Portugal, we heard a lot about the economy, and jobs, but in Spain it was all about politics," said Anelise. And in Spain, the political talk was focused on issues much closer to home. We set up the red sofa in Barcelona and invited people to sit and share their thoughts on the Catalonian independence movement, which was as divisive on the couch as it is in the streets. "We are walking with the pressure of having to be Spain, but we are not Spain. We are Catalonia. The two sides made many mistakes. This is not about who’s right and who’s wrong." "They should sit down to discuss the issues." "I think they have taken the confrontation between us too far." "I know two sisters – one is in favour the other against the independence movement, and when they go to their mother’s house they cannot talk about it." "I think that nationalism is a curse in Europe and the solution is more Europe and less nationalism." "The EU is a disaster for me. The EU is an invention, it is a farce. Europe is insignificant." And in southern France, the yellow vest protesters were eager to share their struggles after 21 straight weekends of demonstrations. The movement has been marred by violence and mixed messages- but for the two French women who sat down on the red sofa, it's truly about one thing. "Why? Well that’s the big question. For the simple reason that life has become too expensive. I find it unacceptable that nowadays we’re not able to live with our income." "There are people that live in places you would not put your dog." "I make 480 euros from RSA (benefits). With that I have to pay my EDF electricity bill, which I just received – 162 euros. I have also just received my water bill from Veolia, thank you, 170 euros. Count it up, that’s what I have left per month. I’m left with 50 euro for four weeks. To live, to eat. All is said." The road trip will now roll on through Italy and many other countries until it reaches Brussels, the heart of the European Parliament. Euronews correspondent Jack Parrock will be taking it on the next leg, so be sure to tune into Good Morning Europe to follow along.